Candy Crush will celebrate later this year its 5th anniversary. The hit game is now played in 196 countries and has recently unveiled its 2000th level. It is also the first ever mobile game to be transformed into a TV show (on CBS in July). This is an interview with Emily Amphlett, games producer working on Candy Crush Saga. Can you give us 3 numbers that describes best Candy Crush’s worldwide success? 2480 is the number of levels we currently have available for our players to enjoy on mobile. 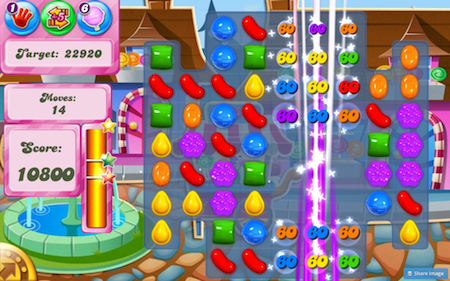 3 is the number of sweet games in the Candy Crush franchise. Everybody knows Candy Crush Saga. Why was it a revolution in the mobile games industry? I don’t think any of the team could’ve predicted the success of Candy Crush Saga when developing the game. We made the decision to launch Candy Crush Saga on Facebook in April 2012, which was a real turning point for King. The game became increasingly popular, on Facebook and then we launched onto mobile in November 2012. Candy Crush Saga is a relatively simple concept that appeals to a mass audience – players must match colorful candies in combinations of three or more to win points. I think the reason Candy Crush Saga was a such a revolution and phenomenon in the mobile games industry is because we innovated a genre that was already popular by adding our own twist on it. We introduced effects such as special candies when you match four or more in various combinations; boosters to help players beat those challenging levels; live in-game events, offering players variety in the game which ultimately makes the game fun and engaging for our audience. I think the idea that a game can be both relaxing and challenging depending on what you’re looking for is also very appealing and a factor in Candy Crush Saga’s success. The different levels encourage you to consider your strategy in order to meet the goal, which helps keep the game refreshing but also provides our players with moments in which they can surprise themselves with what they’re able to solve. That’s really exciting. Everyone on the team is extremely passionate about the game and keeping our audience entertained. It’s been incredible to see people enjoying our game for the last five years, and we hope we can continue the success for years to come. It was the first worldwide successful game with this kind of gameplay. Why did you decide to create a match-three puzzle game? We had been developing match-three puzzle games and casual games long before Candy Crush Saga became available globally. We took a genre that was quite well known and developed it into one of the most popular and widely played gaming formats in the world. colourful candies and the characters, was all crafted to provide our players with the best possible gaming experience to keep them entertained and coming back into the game to play. Candy Crush will celebrate its fifth anniversary later this year. What has changed in 5 years? Has the audience changed since the creation of the game? Ever since the game launched in 2012, Candy Crush Saga has and is still being played by such a huge and diverse audience, made up of people from all different ages and backgrounds. It’s one of those games that you can pick up and play anywhere and at any time when you have a few minutes to spare and want to be entertained. After 5 years, Candy Crush Saga is still played by thousands of players today. How do you explain this long-lasting success? We’re truly astonished by the sheer number of people that play and enjoy the game. Over a trillion game rounds have been played in Candy Crush Saga alone since its launch. It is now played in 196 countries and we are continually attracting new players. 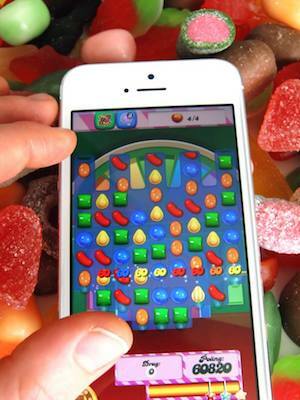 released two other games in the franchise – Candy Crush Soda Saga and Candy Crush Jelly Saga. Creativity is not just about creating new franchises, but introducing new things into existing franchises. The game has unveiled its 2000th level last year. What’s the future of Candy Crush Saga? Will there be a major update, a new story, new characters? existing games, as well as offering players new sister or sequel titles. Candy Crush will come to life this July on CBS. Any other big project related to the game coming out in the next months? Candy Crush is the first ever mobile game to be transformed into a TV show and we’re very excited to see it all come together when the show airs on CBS in July. In addition to the TV show, Candy Crush will also feature in the upcoming Emoji movie coming out this summer. In the Candy Crush scene, the emoji characters are trapped inside the Candy Crush Saga game board and must play through the levels in order to survive. We will also be celebrating the fifth anniversary of Candy Crush Saga’s launch onto mobile later this year, in November.